75 Marlborough is located on the north side of Marlborough, between Berkeley and Clarendon, with 73 Marlborough to the east and 77 Marlborough to the west. 75 Marlborough was built ca. 1864 for shipping merchant and real estate investor John Lowell Gardner, one of nine contiguous houses (71-73-75-77-79-81-83-85-87 Marlborough) he had built as rental property. He and his wife, Catharine Elizabeth (Peabody) Gardner, lived at 7 Beacon and then at 182 Beacon. 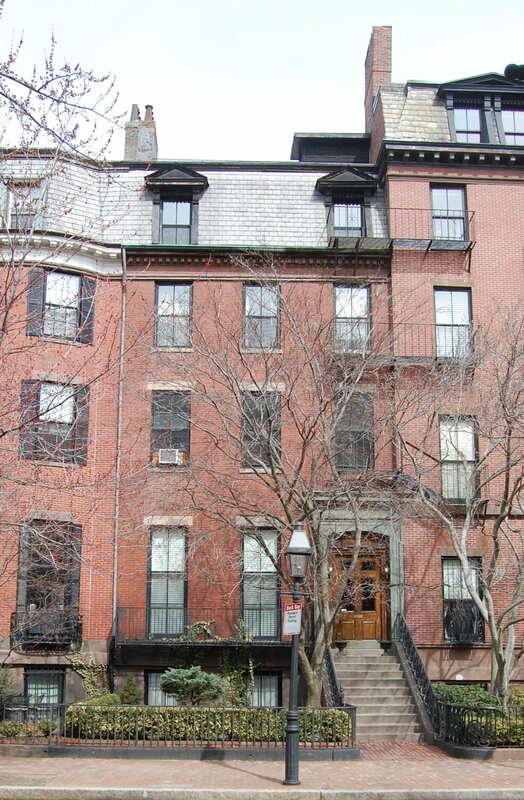 Click here for an index to the deeds for 75 Marlborough. By 1864, 75 Marlborough was the home of William Cushing Paine and his wife, Hannah Hathaway (Perry) Paine. A graduate of West Point, he was an engineer and had served in the US Corps of Engineers until November of 1863. By 1868, they had moved to 46 Mt. Vernon. By 1869, 75 Marlborough was the home of Rev. John Sidney Davenport and his wife, Elizabeth Sewell (Leverett) Davenport. They had lived at 23 Joy Street in 1868. They continued to live at 75 Marlborough in 1872, but by 1873 had moved to the La Grange House at 218 Tremont. By 1873, 75 Marlborough was the home of East India shipping merchant Stanton Whitney and his brother, Frederick Whitney. In 1872, Stanton (and probably Frederick) Whitney had lived with their parents, Israel and Mary (Flagg) Whitney, at 196 Beacon. Stanton and Frederick Whitney continued to live at 75 Marlborough in 1875, but had moved — probably to their home in Beverly — by 1876. Stanton Whitney married in June of 1876 to Alice Rebecca Sutton. By 1876, 75 Marlborough was the home of insurance broker Isaac Frank Dobson and his wife, Ellen (Atkins) Dobson. In 1875, they had lived at 87 Marlborough. They continued to at 75 Marlborough in 1877, but had moved to the Hotel Vendôme by 1878. By 1878, 75 Marlborough, 75 Marlborough was the home of banker George Whitney and his unmarried sisters, Eunice and Mary Whitney. They were the siblings of Stanton and Frederick Whitney, who had lived there in 1875. George Whitney was a widower, his first wife, Mary Elizabeth (Rea) Whitney, having died in May of 1864. He married again in December of 1880 to Elizabeth Whitney. They continued to live at 75 Marlborough during the 1880-1881 winter season, but moved thereafter to 239 Marlborough. Eunice and Mary Whitney also moved from 75 Marlborough and by the 1883-1884 winter season were living at 16 Hereford. By the 1881-1882 winter season, 75 Marlborough was the home of Mrs. Jane Hereford (Hallett) Sayles, the widow of textile merchant Francis Willard Sayles. She previously had lived at the Hotel Vendôme and, before that, with her brother and sister-in-law, Henry and Cora (Lovell) Hallett, at 31 Chester Square. In 1879, she had lived at 74 Commonwealth. 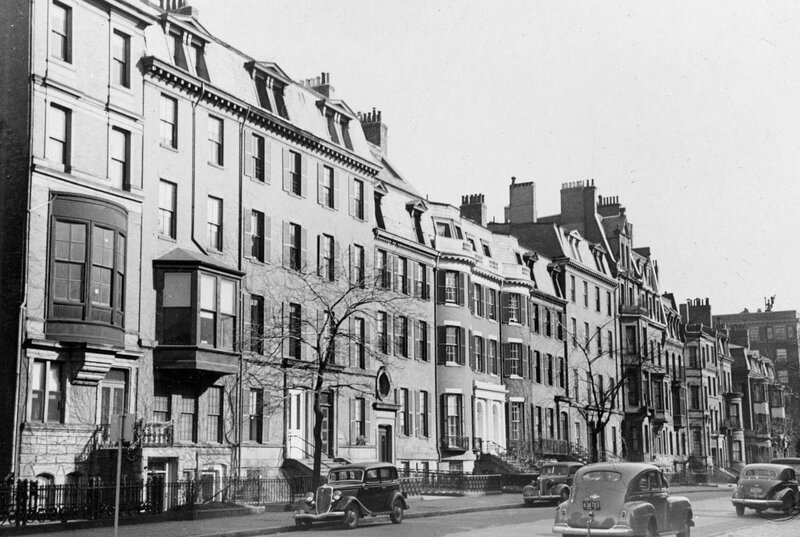 She continued to live at 75 Marlborough during the 1882-1883 season, but moved thereafter to the Hotel Berkeley (southeast corner of Berkeley and Boylston). By the 1883-1884 winter season, 75 Marlborough was the home of Dr. John Wheelock Elliot, a surgeon, and his wife, Mary Lee (Morse) Elliot. They had married in May of 1883, and 75 Marlborough probably was their first home together. They continued to live there in 1892, but by 1893 had moved to 124 Beacon. By the 1893-1894 winter season, 75 Marlborough was the home of Rev. Edward Lord Clark and his wife, Susan Grafton Prescott (Clark) Clark. He was minister at the Central Congregational Church (Berkeley at Newbury) and also a noted Egyptologist. He previously had been pastor of the Church of the Puritans in New York City, which he had founded; he had resigned earlier in 1893, having disagreed with several matters of church doctrine, and had joined the Congregational faith. The Clarks continued to live at 75 Marlborough in late 1901. He resigned as pastor of the Central Church in December of 1901 and they moved soon thereafter to Kennebunkport, Maine. By the 1902-1903 winter season, 75 Marlborough was the home of John Joseph May, a hardware and metals dealer. He was a widower, his wife, Caroline Simpkins (Danforth) May, having died in June of 1900. They had lived at 987 Dorchester Avenue. Living with him at 75 Marlborough were their daughter, Mary Louisa (May) Winsor, the wife of Gershom Crayton Winsor, and the Winsors’ two daughters, Mary May Winsor and Mrs. Florence May (Winsor) Churchill, the widow of John Maitland Brewer Churchill, a lawyer, who had died in July of 1900. John May died in May of 1903. 75 Marlborough was not listed in the 1904 Book Book. By the 1905-1905 winter season, 75 Marlborough was the home of Ellen (Shaw) Barlow, the widow of Francis Channing Barlow, and her adult sons, Robert Shaw Barlow and Charles Lowell Barlow, both attorneys. Francis Channing Barlow had been an attorney and politician. He enlisted at the beginning of the Civil War as a private, and served for the duration of the war, rising to the rank of Brigadier General. He was elected Secretary of State of New York in 1865 and served until 1868, when he was appointed US Marshal for the Southern District of New York. In 1871, he was elected Attorney General and served one term. Thereafter, he practiced law until his death in January of 1896. On May 16, 1907, Charles L. Barlow purchased 75 Marlborough from the trustees under John L. Gardner’s will. On April 15, 1908, he transferred the property to his mother. Ellen Barlow and her sons continued to live at 75 Marlborough until late 1910. On November 17, 1910, 75 Marlborough was purchased from Ellen Barlow by Martha (Rawson) Bayley, widow of boot and shoe manufacturer James Cushing Bayley. Martha Bayley was joined at 75 Marlborough by her son, banker James Cushing Bayley, Jr., and his wife, Harriet (Brinton) Bayley. They previously had lived in an apartment at 199 Marlborough. Martha Bayley continued lived to live at 75 Marlborough during the 1914-1915 winter season, after which she moved to the Hotel Vendôme. James and Harriet Bayley continued to live at 75 Marlborough. On March 6, 1930, his mother transferred the property into his name; she died the next year, in July of 1931. James Bayley died in August of 1943. Harriet Bayley continued to live at 75 Marlborough until about 1955. On February 14, 1956, 75 Marlborough was purchased from Harriet Bayley by Edward M. Walsh and his wife, Octavia Morley (Sawyer) Walsh. They previously had lived at 73 Marlborough, which they had converted it into a lodging house and then sold the same month as they bought 75 Marlborough. 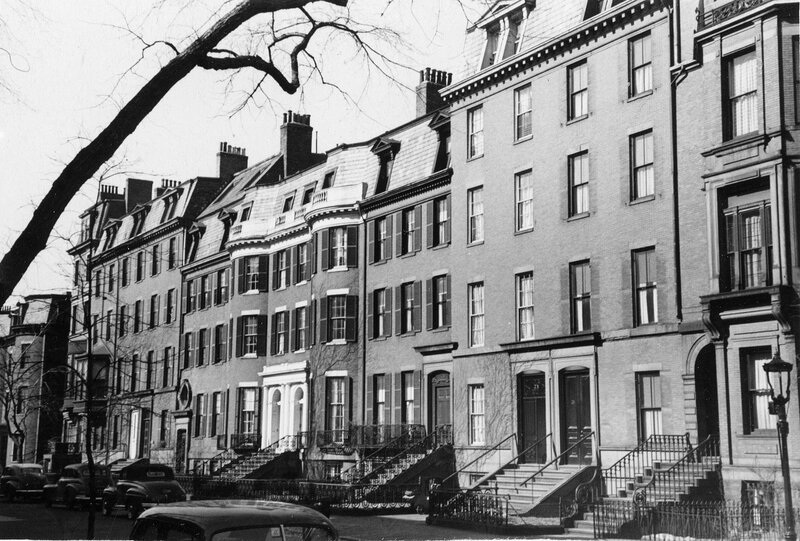 In June of 1956, Edward Walsh applied for (and subsequently received) permission to convert 75 Marlborough from a single-family dwelling to a single-family dwelling and lodging house. Edward Walsh died in August of 1959. 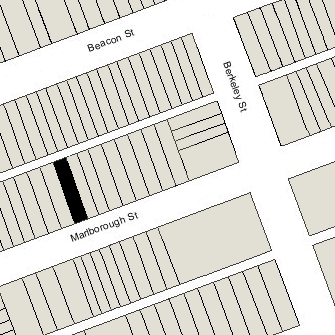 Octavia Walsh continued to live at 75 Marlborough in 1961, but had moved to 191 Beacon by 1962. On August 31, 1961, 75 Marlborough was purchased from Octavia Walsh by James J. Cornell and Harlan T. Crider. It subsequently changed hands, including going through foreclosure, and on September 21, 1978, was acquired by Leonard F. Conway, Jr., John V. Cunney, and Lisa Paszamant, trustees of the West End Realty Trust. 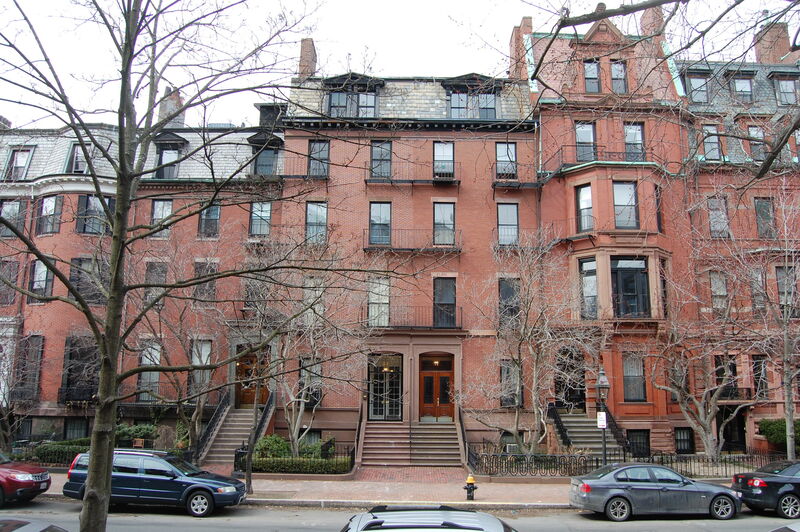 On June 20, 1979, the West End Realty Trust converted the property into five condominium units, the 75 Marlborough Street Condominium.